If you thought you couldn’t love him any more, well, be prepared. We’re all familiar with Bullet Time Keanu, bodacious Bill and Ted-era Keanu, and, of course, Sad Keanu—one of the internet’s best-loved memes. But there’s another side to the Canadian star that you might not know about. Allow us to introduce you to one of the kindest people in Hollywood: Mr. Keanu Reeves. Keanu’s tastes are simple. He cares not for the almighty dollar. But seriously, he really, really doesn’t care. 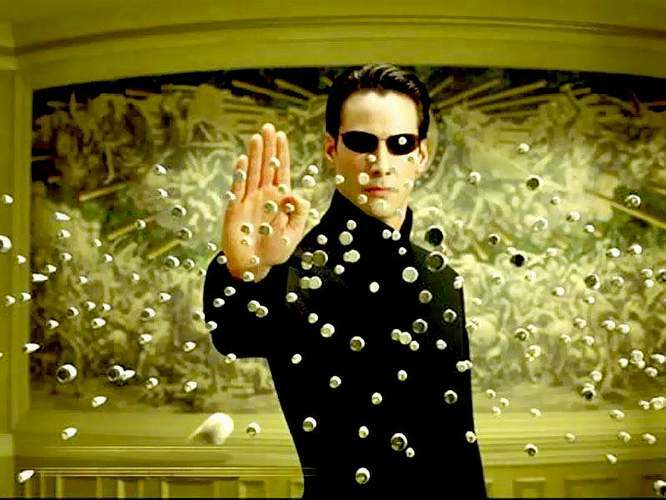 Reeves is reported to have taken an $80-million-sized chunk out of his $114 million Matrix trilogy paycheque and handed it over to the makeup and effects team for their hard work on the films. A clear sign he cares about the environment, public transportation, and humankind in general. No manspreading here. Reeves even offers up his spot to a fellow commuter who isn’t pregnant, elderly, and/or missing a limb (the only criteria that’ll get you a seat on during rush hour). He’ll make you feel good about your fashion choices. From a clothes-conscious Reddit user: “I once saw Keanu Reeves at a party in L.A….he was walking past me and I said, “Hi, my name is Steven,” and he said, ‘Nice to meet you Steven, I’m Keanu, I like your jacket.’ That was an awesome night.” Go ahead, Steven. Pop your collar. He didn’t ditch his regular friends for famous friends. He laughs at your internet jokes. On his entry into meme-dom: “My first experience with that was Sad Keanu, and I thought it was funny!” — Keanu Reeves, coolest guy on the planet. He’ll make your dad’s day. He also makes people’s entire decades without even knowing about it. Brace yourself, this story is intense. It was shared with Keanu during his AMA, and his response is beautiful. If your eyes aren’t watering up right now, you may want to get your tear ducts checked out. He’ll line up to get into his own party. In the rain. The phrase “Do you know who I am?” isn’t in Reeves’ vocabulary. Unlike other big (and a few small) stars, when Keanu isn’t recognized by the person working the door, he doesn’t freak out — even if it’s his party. Last December, he stood in line outside like a civilian waiting to get into the wrap party for his latest movie, Daughter of God. Later that night, he found and returned a fellow partygoer’s credit card. He’ll buy you (and all your coworkers) breakfast. Lunch too. He graciously ignores questions about his immortality.